Some people have tried everything to treat their migraines, but still can’t find the relief they desire. Plastic surgery is a viable treatment option for many people who have been clinically diagnosed with migraines. 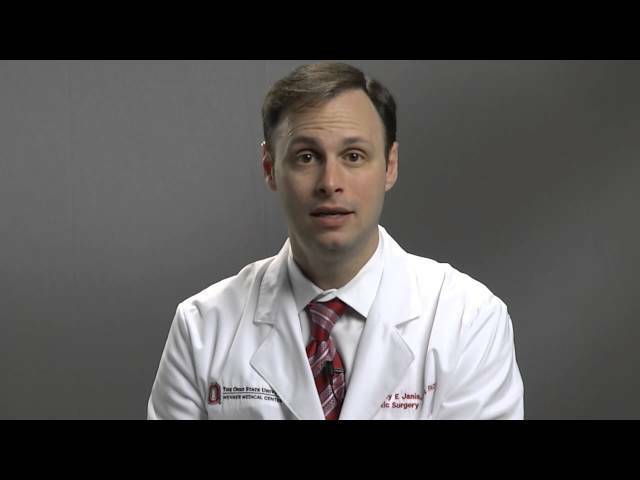 The doctors at The Ohio State University Wexner Medical Center have led the breakthroughs in this revolutionary effective treatment over the past 10 years. Peripheral nerves of the head and neck can get irritated, compressed or entrapped and trigger migraines. Nerve decompression surgery removes muscle tissue (tough tissue called fascia), bone or blood vessels that constrict the nerves, giving the nerves more room and improving or relieving the condition. Migraine nerve decompression has been researched and implemented at Ohio State’s Wexner Medical Center, yielding a high success rate – over 94 percent of patients get significant improvement or elimination of headaches. Plastic surgery for migraine requires specialized expertise and experience. It is not performed anywhere else in the greater Columbus area and only in limited institutions across the country. Our team’s approach helps make breakthroughs like this possible by tapping into the expertise of our various physicians. In the case of migraine, we achieved these results by having neurology, neurosurgery and plastic surgery all work together. Contact us today for more information or to schedule a consultation. Our doctors will treat you like family and ensure you get the best care possible. By relieving pressure on specific nerve branches using BOTOX® or anesthetic injection, our doctors figure out an individual’s trigger-point roadmap. The roadmap helps identify the areas of discomfort believed to be caused by nerve compression. Based on results and relief from migraines, a determination is made whether or not nerve decompression surgery is an option. Nerve decompression surgery is performed using a general anesthetic. Various procedures may be part of the same surgery based on the number of nerve compression areas identified by the trigger-point roadmap. The surgery can be less than two hours long or longer, depending on the amount of trigger points an individual has been diagnosed as having. Nerve decompression surgery is often on an outpatient basis, but an overnight stay may be required. The recovery period from nerve decompression surgery can be four to six weeks, but it will take about three months to determine the success of the surgery. During the recovery period, swelling and inflammation around the surgical area are expected. For a minimum of three weeks, there should be no lifting of objects heavier than a gallon of milk. No strenuous activity that causes you to sweat or raises blood pressure or heart rate should be performed. Swimming, curling irons and chemical hair treatments are also not permitted. Why see a plastic surgeon for migraines? Hear how Jeffrey E. Janis, MD, FACS, authored anatomical nerve compression studies and clinical studies, which led to the safe and effective use of plastic surgery techniques to treat migraines. Learn about the roadmap of trigger points he used to design individualized treatment that relieves migraine symptoms.